Cross Currents explores the rich, ongoing relationship between the U.S. and Japan over the past fifty years. This site can be explored in two languages, English and Japanese. You can switch between languages by clicking on "日本語サイト" in the upper-right hand corner of the page. Learn About Japan Learn About Japan-U.S. Cross Currents Learn About the U.S.
What happens at special times of the year in Japan, at school, at work, and in the community? 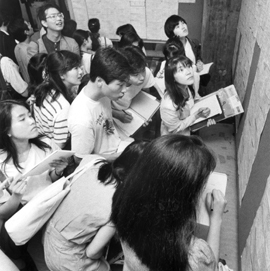 How has work in Japan changed over the last 50 years? What do the Japanese eat? How is food grown and processed in Japan? What is it like to go to school in Japan? How do families live in Japan? How do Japanese participate in their society? What holidays and seasonal activities do Japanese and Americans share? How has work in Japan influenced work in the U.S.? How has work in Japan influenced work in the U.S.? How have American and Japanese food and agriculture influenced each other? How has education in Japan influenced education in the U.S.? How has education in the U.S. influenced education in Japan? How have families in Japan and the U.S. influenced each other? How have citizens in Japan and the U.S. influenced each other? What happens at special times of the year in the US, at school, at work, and in the community? How has work in the US changed over the last 50 years? What do Americans eat? How is food grown and processed in the U.S.? What is it like to go to school in the U.S.? How do families live in the United States? How do Americans participate in their society?